I'm trying to initiate the transfer_all.vbs from a Win10 machine, with the data being copied up to a network share residing on a Win Server 2016. I tested a network share on the same vlan and ensured I can communicate between the two with an existing 2012r2 box as well. 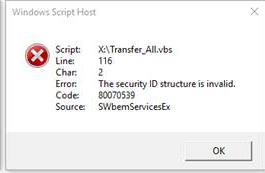 Running the script creates a folder with the host name at the destination, but the folder is empty and then that error appears. Please let me know if you need a copy of the updated scripts emailed, as I'd rather not post them here with our company info. I sent the same question, with the scripts attached in a zip file, to support@forensit.com, as well as info@forensit.com and haven't received a response yet.